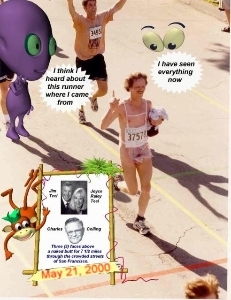 I have been running for nearly 44 years. I have enough running miles on my feet to take me around planet Earth three times. In fact, the mountain lion that chased me when I was on my first trip around planet Earth, it is the exact same mountain lion that tried to chase me while going around the third time. I know because part of my running pants, when it tried to runnernap me on the first trip around, was still hanging out of its mouth. It's possible too that with the amount of running I did on bike paths and running trails in my life, I alone may have eliminated 5% of the World's ants. A little running humor. In 2010 I ran my first two organized half marathons. In my first half marathon, I finished first for the 55-59 age group and ran a 1:41. My second half marathon I ran in 1:40, a tad faster, but I finished 4th for my age group. 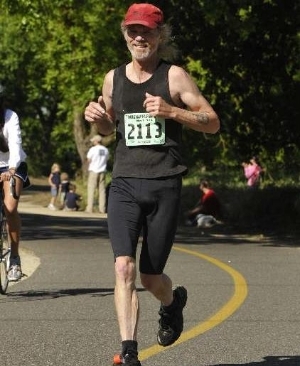 Note: When I first started running in Boise, Idaho, back in the early '70s, there weren't any (?) public organized races around-except for the Boston Marathon. In fact, I believe I was one of the few people in Boise running the streets and the tracks during this time period. The first organized race I entered was back in 1980. It was a race called the "Weinstock's 5-mile-foot-race." Weinstock's was a large upscale department store and this chain of stores was later bought out by Macy's and renamed Macy's. The race started at Sacramento's downtown plaza. I had worked all night at a Lucky store where I was the night-crew manager. I asked the store manager, John Maglietta (misspelled) that I wanted to enter my first race and requested that night off. However I wasn't given the night off so I could sleep before the race and be well rested. I arrived at the race location at about the time it was about to begin. I jumped into the crowd and before I knew it I was running and trying to get myself to a comfortable pace. I had established running 5-minute miles during the weeks before the race so I felt I could post a respectable time. I came in 20th place (I believe) in a race with over 1200 runners. My race time was 27.03 (I believe) which was OK. I felt I could have lowered my finished time had I been at the front of the pack where most of the fastest runners started from. This was my first race after being a distance runner for many years. My first goal for 2011: To become healthy and injury free. I hurt my left achilles tendon back in November of 2010 and then injured my left leg calf. I have had a difficult time with these two injuries. Note: Until I turned 55, I didn't have that many injuries attributed to my running. But it seemed after I turned 55 I started to incur injuries such as pulled calf and hamstring muscles. I also want to thank Doctor Gallawa for helping me with my feet when he discovered a broken bone in my foot when other doctors were telling me they couldn't explain the terrible pain in my foot. Dr. Gallawa also provided me with great orthotics and I would recommend Gallawa to anybody who needs professional help with their troubled feet. Even though I finished 1st in my age category, I wasn't excited about my finish time. I did make one mistake. I happened to spend a couple of miles of the race course talking to a nice fellow runner, Mark Ashenfelter, who finished right behind me in this race. I may have wasted extra valuable energy while talking to this runner-oh well, I was happy overall with my first half marathon race. I can thank God for assisting me at this race. I didn't stick around to receive my award for winning my age division. I then ran the American Parkway Half Marathon on May 1st. I ran out of gas half way through so I wasn't too impressed with my performance. Oh well, it's all part of the progress. My second goal: To qualify for the Boston Marathon-if I do that really would be great, but it is not that important to me. 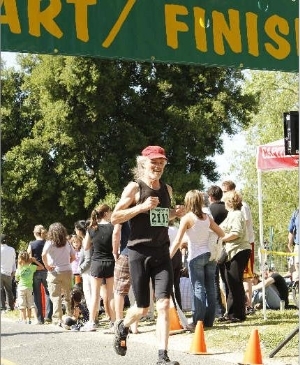 When I was age 49, I had trained for an entire year for the 2000 CIM, here in Sacramento. I was putting in 22 miles every other Saturday during that year. I was training for a 2:45 time which would have qualified me for the Boston. I ran so much during that training year my immune system was lowered and I had caught the flu a week before the race and was told by my doctor that running this race would be risky and so I determined that regaining my health was more important than running this race. I wasn't very happy and I probably will never consider this marathon to run in the future because of the time of year this race is scheduled, which is December---during a time when colds and the flu are "running" rampant. Right now though, I need to rid myself of the left leg injury which has been difficult for me to do. When I do qualify for the BM, I will have to decide if I want to travel to Boston to run it. I don't have too many pictures of me from my running past. Below, to the left, is a photo of me and my two kids at a Blood Run-probably in the late '80's. Over to the right is my great run in San Francisco in May of 2000. On the calandar below I will keep track of my running. Updated: Back in September/October 2010, I had terrible pain in my knee and found out I had a tear in my meniscus (cartilage) and was forced to quit running for a while. I recently restarted my running on a tread-mill at a gym. Currently my knee has really improved but I still don't feel comfortable running on the hard surfaces/streets at this time. A orthopedic doctor told me that my meniscus could heal but these kinds of injuries heal slowly because of the lack of blood supply to the meniscus. Sometimes it requires surgery but I don't believe I will go in that direction. 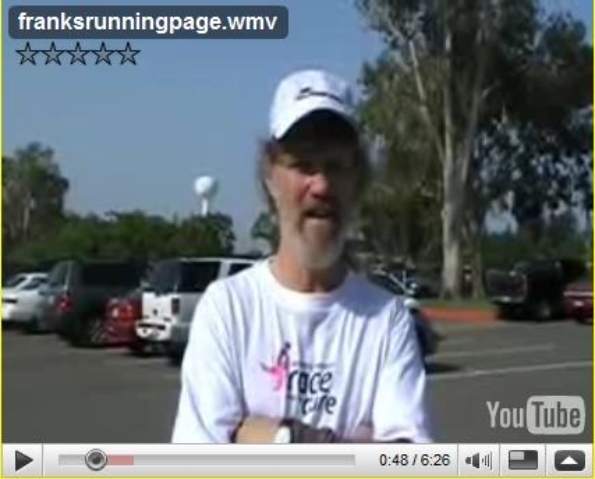 Click on the youtube image below to view Frank at Sacramento's Susan G Komen Race For The Cure. This is the only 5K race I have run. But they didn't keep race times or results for any runners so I don't really consider this an actual race.